Mobile applications provide small, immediate ways to connect with your customers. 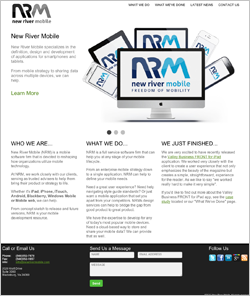 New River Mobile, a division of ACI, builds mobile applications for all mobile platforms. With years of experience in BlackBerry, Apple, Android, and Windows, NRM brings ACI’s reliable software and design processes to the mobile marketplace. ACI and New River Mobile work closely with you to develop integrated mobile solutions, on the web as well as native mobile applications.